Making dependency relationships in Project 2013 is simple: You create a dependency, select the dependency type, and build in any lag time or lead time. The tricky part lies in understanding how each type of dependency affects your plan when your project goes live and you start to record actual activity that resources perform on tasks. When you create a dependency, it’s a finish-to-start relationship by default: One task must finish before another can start. If that’s just the kind of dependency you want, that’s all there is to it. If it isn’t the kind you want, after you create this link, you can edit it to change the dependency type or to build in lag or lead time. Therefore, if you’re not careful in how you select the tasks, the dependency arrow will go backward in the schedule. Display Gantt Chart view and ensure that the two tasks you want to link are visible. You may have to collapse some tasks in your project or use the Zoom button on the View tab to fit more tasks on the screen. Click the predecessor task and Ctrl+click the successor task, and when both tasks are highlighted, click the Chain Link icon on the Task file tab. You can continue holding down the Ctrl key and highlighting as many tasks as you want to link. You can link multiple tasks in a row in a finish-to-start relationship by clicking the first task and dragging to the last task. When you release the mouse button, click the Chain Link icon to link all the tasks in order. Best practice is to link only subtasks, which represent the actual work performed, not the summary tasks. The Ctrl+click method is helpful for skipping over summary tasks when selecting tasks for linking. Also, whether you use the mouse or the Link Tasks button to drag between tasks, the task that’s selected first always becomes the predecessor. Therefore, if you’re not careful in how you select the tasks, the dependency arrow moves backward in the schedule. The Task Information dialog box opens for the selected task. On this tab, you can build as many dependency relationships as you like. In the ID field, type a task ID number for the predecessor task. Alternatively, you can select the task from the Task Name drop-down list. All the tasks you’ve already entered into the project appear. To display this list, click the next blank Task Name cell and then click the drop-down list arrow that appears. The task name and the default finish-to-start dependency type showing 0d (no days, which is the default unit of time) of lag time are entered automatically. Click the Type column and click the arrow that appears to display the dependency types, and then click the appropriate dependency for your situation. If you want to add lag or lead time, click the Lag field and use the spinner arrows that appear to set the amount of time. Click up to a positive number for lag time, or click down to a negative number for lead time. Repeat Steps 3 through 6 to establish additional dependency relationships. When you’re finished, click the OK button to save the dependencies. To “keystroke” a link between tasks, select both tasks and then press Ctrl+F2. To unlink, press Ctrl+Shift+F2. 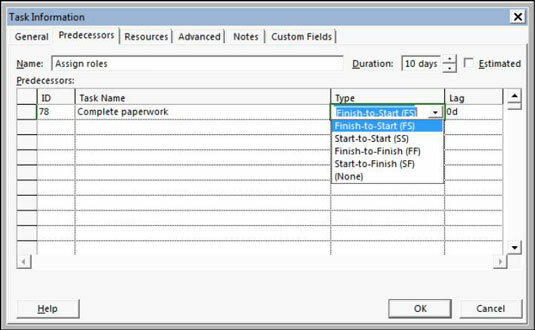 Another way to enter dependencies is to expand the Task Sheet pane until you see the Predecessors column. You can enter the task number of the predecessor task directly into that column.